Go Baby Go is a project from the University of Delaware that demonstrates a quick and easy way to create mobility tools for children using ride on top Powerwheels cars. The Go Baby Go project has grassroots activity around the globe; people do not need to sign a form or be an engineer, you only need the curiousity and an hour or two. In early November, DIYAbility gave it a try for a local family’s two year old son. Why is Go Baby Go Such an Important Project? When a young child begins to move, creep, crawl, and walk, they are exploring their environment. They are learning about the world around them and the objects in it. This includes visual perception, depth perception, trunk stability, postural reflexes and responses, cause and effect. Their mobility motivates them to do “more”, to continue to reach, trial, and learn on a daily basis. Children with impairments that limit their mobility are lacking in this development. Not only is their functional development impaired but their social development is as well. These children can seem socially withdrawn and are passive in their environment versus being an active participant. The use of a mobility aid that a child can control can eliminate these impairments. It allows a child with a disability, through the use of assistive technology, to explore their environment. The Go Baby Go project is working to provide mobility aides to children with significant disabilities. Through their initiative, these children are provided with not only a mobility aide but a fun one at that. Obtaining power wheelchairs can be challenging for young children, not all insurance companies will cover these chairs or will not cover the chair until they are older. The cars that are being used decrease the stigma for these kids versus using a standard power wheelchair since they could be used by any child. This amazing project is providing mobility to children at a younger age helping them to develop on an apprpriate timeline. How Did DIYAbility Become Involved? We have always admired the Go Baby Go project from a distance so when we were asked to help adapt a car for a local boy there wasn’t a second thought. Modifing toys is something we have been doing from the beginning of DIYAbility – by hosting Hacking for the Holidays and other workshops that teach tools and techniques for making and modifying the world for accessibility. Go Baby Go is the the ultimate toy hack, not only are you rewiring a toy – it’s a ride on top car for kids with mobility impairments. The parents selected the Lightning McQueen Disney character car which was listed in the Go Baby Go sample project. 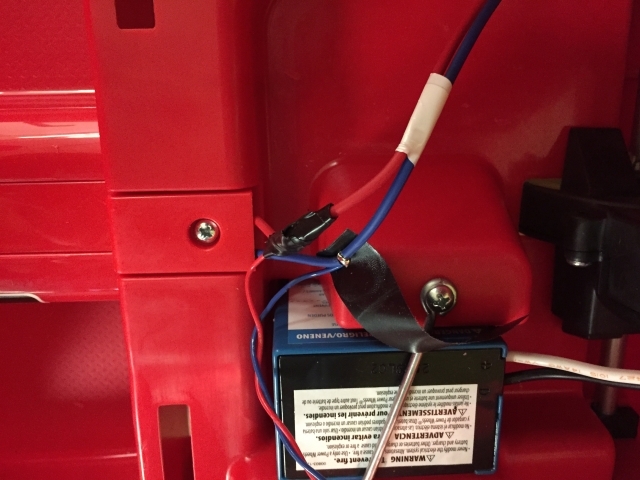 The car is very light, costs under $100 and can be modified to accept a standard mono plug capability/access switch, like the Jelly Bean or Big Red button. The first thing we did with the car was to assemble the steering column and see if the battery and existing switch worked. The car worked as expected so we started with the wiring in a switch jack. 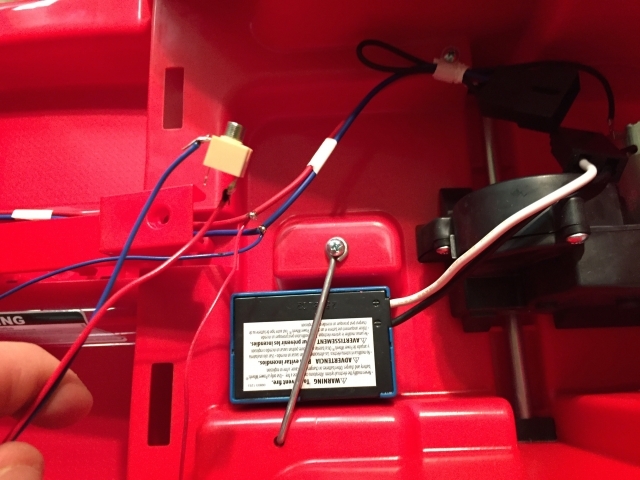 The wiring – unlike the sample project we did not cut the car’s main drive switch from the steering wheel instead we installed a mono jack (female side) on the backside above the tail lights that could accept a capability/access switch. With the mono jack the family, phyiscal therapists, occupational therapists could plug in whatever switch they wanted our little driver to use, this could be for an exercise or just a switch that works best with him. To exercise his arms and hands the switch could be placed in front of him on the steering wheel. Or if the exercise was to work on his trunk and core muscle the switch could be placed behind his head so he needs to sit up straight to drive the car by pressing his head back onto the switch. The wires for the existing car switch are located on the car floor between the legs. After unscrewing the wire compartment we carefully stripped/exposed the copper from both wires but did not cut all the way through the wire. By tapping the existing wires and not cutting them we took our own wires and wrapped it around the car’s copper wire. We soldered the car wire and our wire together, both sets soldered then tested our circuit by touching the two new wires together. Success. We soldered the mono switch jack to the end of the new wires and drilled a 1/4″ hole into the car to mount the switch jack. Tested again with a real capability switch. Success again. Last and most important, we wrapped the two solder joints in a generous amount of electrical tape. Put all the wires back in their place and put the car back together. The car was also adapted with a PVC pipe support system complete with swimming noodle for cushion. The pipe was cut to length, drilled and bolted to the plastic car shell. We used the bandsaw at our workshop but you could use a PVC pipe cutting tool. The swimming noodle was cut to length to cover the pipe where an arm or head might come into contact. The noodle also served as a way to hide the switch wires by running them between the pipe and noodle. 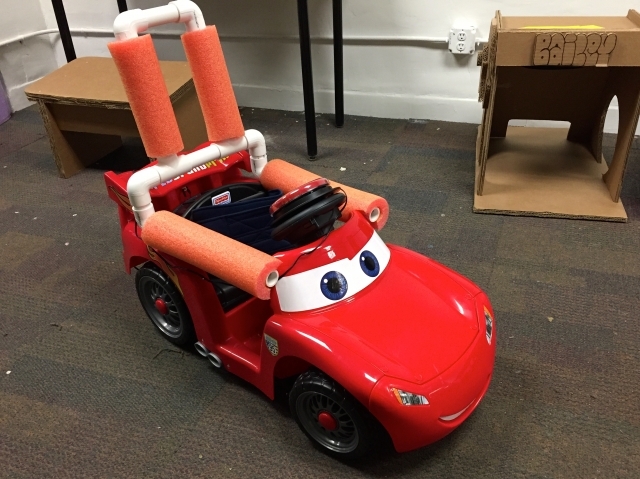 Adapting a toy car this size was a lot of fun we would love to hear from families, physical therapists and occupational therapists who have a child in mind that could use a hot ride mobility tool like these. We’d love to help and perhaps host a workshop in Midtown if there is enough interest. Please get in touch with us if you have any questions, [email protected] See more photos on our Facebook album.